Or more accurately, it should have started a lot later. Ball could comfortably have excised most of the first hour and gone straight into the good stuff, so ensuring fatigue didn't get the better of the audience. Certainly, it took me three sittings to get through Death Cure, and I say that having, on balance, enjoyed it. Once the action reaches the Last City, the movie hits its stride, and for what is reportedly a medium-range price tag ($62m) Ball puts every bit of it on screen. The city sequences are well-staged and verisimilitudinous, and a fair degree of tension is built up by as the group enter WCKD headquarters in disguise. They're there, ostensibly, to rescue Minho (Ki Hong Lee), who I had no recollection of thanks to the three years since the last movie. But hero Thomas (Dylan O'Brien) as much wants to catch up with Teresa (Kaya Scodelario), who only went and betrayed him last time out. At this point in the story, one of the issues is that the constraints of its youthfulness begin to show. It's one thing to have these kids on the run, but to have Thomas now a respected leader strains credulity. Not that there are many adults about apart from Barry Pepper and Giancarlo Esposito. And later, Walton Goggins in some gnarly noseless makeup that renders his precious hairpiece/plugs untarnished. O'Brien's consistently the weak link in all this, desperately trying to be a young Mark Wahlberg but coming across more like Colin Hanks. In contrast, Scodelario, Thomas Brodie-Sangster (Newt) and Will Poulter (Gally, back from the grave) all acquit themselves with honours. Teresa has surprisingly layered motivation, ostensibly doing our heroes gross injustices but motivated out of entirely utilitarian principles. Indeed, if Thomas had only listened to her rather than raging and hitting things, Newt might have survived. Of whom, Sangster pulls out all the stops wrestling with his better nature as he transforms into a Crank. Rose Salazar (the enhanced-eyed lead in the forthcoming Alita: Battle Angel) is also good as Brenda, but has little to do beyond mooning after the unattainable Thomas. While there are some solid plot developments along the way – the Last City has been an enclave protecting WCKD and a populace living relatively normal lives, give or take a nightly curfew, but now we learn the virus has gone airborne – there's unfortunately a rather trite, obvious saviour solution to everything; it's Thomas whose immunity represents the key to a cure. We're also faced with a crazed Aiden Gillen indiscriminately going on the rampage during the climax, which is incredibly tiresome (he really needs to start turning down these bad guy parts, or find a more interesting way to play them). By the looks of things, the survivors have Lord of the Flies all over them, aside from two old types, so who knows what state they'll be in a few years down the line. 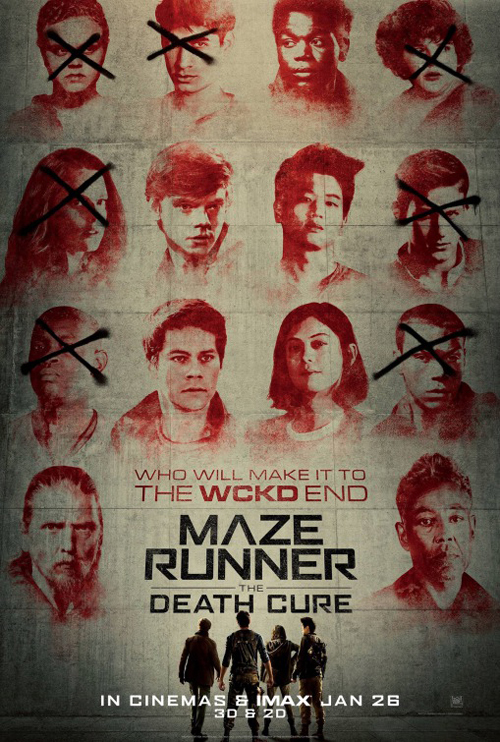 Death Cure arrived a good year later than expected due to O'Brien's serious injury during initial filming in early 2016. As such, it probably lost all the momentum it had going for it. Albeit, The Scorch Trials was also a step down on the breakout success of the original. Nevertheless, the bottom didn't fall out of this franchise, and if you can stick with it through the bloat, it's a reasonably satisfying conclusion.